When an improved mechanical arm loosened and sucked up a semi-hardened material similar to Hanford tank waste, it passed the initial testing phase with flying colors. Such tests are essential for converting actual waste to a glass-like form for ultimate disposal. Pacific Northwest National Laboratory engineers, working with Washington River Protection Solutions, recently demonstrated a new tank waste retrieval method that met all performance goals in the first stage of testing. The highly radioactive waste in 177 underground Hanford tanks has been an unwelcome “guest” since World War II, especially when some tanks started leaking years ago. While some single-shell tanks have been emptied, engineers have struggled with how to get the remaining, partially solidified waste out of the remaining tanks. This waste must be retrieved and pumped into double-shell tanks before it can be transformed into a stable, glasslike substance for final disposal. Workers removed the easy-to-pump, liquid waste from the single-shell tanks years ago. But the waste that remain in some tanks has thickened into layers with the consistency of mud, wet clay, and even brick. Not only is it difficult to access the underground tanks through small openings, but the radioactive and chemical waste formulation limits the types of equipment that can be used. In the test, the team used an improved, remotely controlled dislodging tool to shoot water into simulated waste to break up the material and vacuum up the resulting slurry. The tool is based on a design originally developed at PNNL, then adapted by Oak Ridge National Laboratory to remove radioactive sludge in underground tanks at its Tennessee site. Subsequent enhancements included a port to clean debris from the screen and a surrounding “skirt” to better confine the water during retrieval. The improved device uses less water than other methods previous tested. That’s important because it reduces the amount of additional radioactive water that must be treated and disposed after the waste is retrieved. 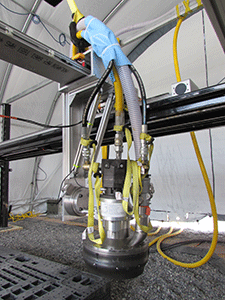 For the test, the retrieval tool was mounted on a robotic gantry system above 8-inch-deep troughs of simulated waste. The system moved back and forth across the trough at 2 to 5 inches per second, blasting the “waste” with high-pressure water streams of up to 10,000 pounds per square inch. PNNL engineers documented the retrieval rate, water/mass balance, reaction forces, and the spray’s effect on visibility. They achieved every goal set for the test. In the coming months, the team will optimize the water-handling performance and then work on lifting the retrieved “waste” into a separate tank. These kinds of tests, and many others, will continue to resolve important technical and engineering issues before all waste can be disposed permanently in the coming years. PNNL led the test under contract to Washington River Protection Solutions, the DOE contractor responsible for Hanford tank operation. DOE’s Office of Environmental Management funded the work. PNNL Research Team: Eric Berglin, Jason Mount, Beric Wells, Brian Hatchell, Carolyn Burns, and Sharon Bailey.